11.01.2003 - I get a lot of phone calls for the removal of dead animals inside houses. Such an even causes a very strong odor inside the house. Sometimes the smell is so bad that the inhabitants cannot bear to live in the house any longer. If the person in the house realizes that the source of the stench is from a dead animal that is decaying, they can call me, and I'll come and remove the rotting critter. The animal could have died in a variety of places - under the house, in the wall, or so on, but oftentimes the dead body is up in the attic. If I determine, based on my analysis of the house architecture, and my sniff test, that the animal has died up in the attic, I go up and start my search. In this case, when I got into the attic, I saw all kinds of evidence of animal activity. I saw tracks in the insulation, fur, and most of all, a lot of droppings. However, I didn't see any dead body. Yet the stench was so strong that I knew it was up there. Step One - I searched and searched, moving back and forth in the attic and found the area with the worst smell. Sure enough, the dead animal had burrowed its way under the insulation, because that's where my nose detected the strongest odor. Step Two - I dug around under the insulation in the worst-smelling area, until I uncovered the carcass. Step Three - I bagged it in a plastic bag, along with the insulation that was now dripping with stink juice and maggots. Step Four - I sprayed the area, especially the soaked ceiling drywall, with an enzyme-based biohazard cleaner. I then took the animal out of there, and collected my money. I advised the homeowner to have the giant holes in their roof fixed, so that no other animals would get back into the attic again. I offered to do this at a low, low price. 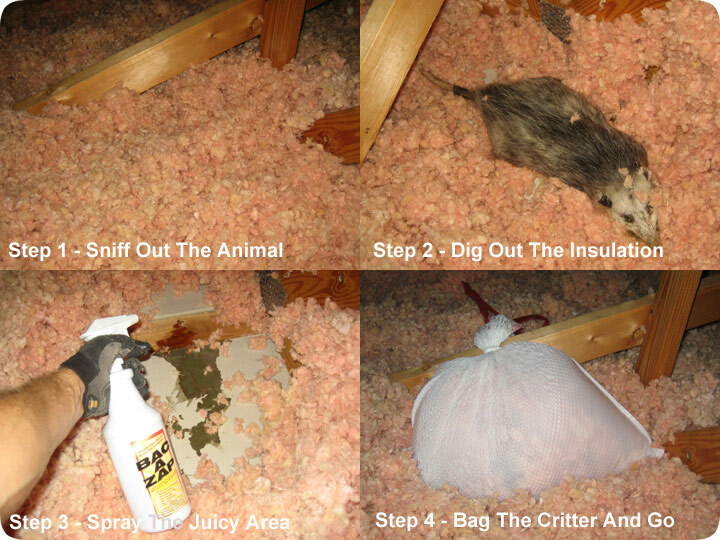 Of course, the homeowners lived with a big opossum up in their attic for a while and didn't care, so they didn't have the roof fixed, so this is bound to happen again, and I guess they'll only call me out again when they're gagging and can't live in the house due to the extreme smell.